The Marwari businessmen of Kolkata are a worried lot under Mamata Banerjee's rule. Around a thousand people had gathered at Shibpur, south of Kolkata, on an October morning to take part in the Shri Mahaluxmi Mahayajna being conducted by Swami Prakharji Maharaj of Haridwar. He was assisted by at least another hundred pundits, while 500 men, drawn from 15 states, chanted sacred hymns. Those in attendance were praying for industry to return to West Bengal. It had been organised by the Marwaris of the city - Rajasthani businessmen who have been around for almost two centuries. Basant Kumar Birla was the first to pour ghee and set the holy fire going. Others supporting the event included Emami founders R S Goenka and R S Agarwal, Shree Cement Chairman H M Bangur, and Rupa Chairman and Managing Director P R Agarwal. Five months ago, on May 18, Mamata Banerjee had come to power, ending 34 years of communist rule in the state. There was optimism in the air as Kolkata hoped to regain some of its lost glory. Kolkata was a thriving business hub till the 1970s, when the Naxalite movement and militant trade unions drove businessmen and companies out of the city: Philips, JK Paper, Brooke Bond, Bata, ICI, Shaw Wallace and Ispat. Hari Shankar Singhania had recently said that it was trade union violence, tacitly supported by the state government, that led to his relocation from Kolkata to Delhi in 1970. "The work atmosphere was vitiated. Productivity was hampered by political interference," he had said. Banerjee was not expected to win back men like Singhania, but there was hope that she would draw investments into the state. Three months later, the euphoria of Shibpur has more or less dissipated. On December 9, 90 people were killed in a fire at AMRI Hospital, and its promoters, two of the men backing the yajna, Goenka and Agarwal of Emami, have been in custody for over 50 days now. In contrast, the non-Marwari office bearers were taken into custody 45 days after the fire and the government nominees are still at large. Marwaris fear that Banerjee has played to the gallery - her vote bank doesn't seem to mind the incarceration of the businessmen. This is what bothers them the most. When she was approached by some Marwaris on the issue, she thundered: "A chamber has said that the directors of AMRI should be released. I want to tell them that we want industry here, but we don't want industry that will kill people. Terrorists are terrorists." 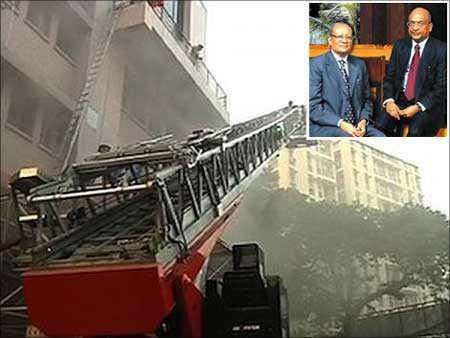 Image: File photo of firemen trying to rescue people trapped in the AMRI Hospital fire in Kolkata. (Inset) Emami Group founders R S Agarwal and R S Goenka. What may have worsened matters was the closeness of some Marwari businessmen to the earlier communist regime. The standard joke was that the "M" in CPI(M) stood not for Marxist but Marwari. Privately, leading Marwari businessmen admit that they have come under pressure in the last few weeks from their independent directors who now want to leave - they never know what they might be hauled up for. Still others don't know how the administration will respond to their requests. A leading businessman who owns a jute mill in Kolkata wants to convert some unused land into a shopping mall, but has decided to lay low for the time being - in the current environment he sees no hope of the government agreeing to change the land-use agreement. Marwari charities too have seen some exits, which could get worse in the days to come: Arun Poddar has resigned from the board of Anandalok Hospital, H P Kanoria from Vishuddhananda Saraswati Marwari Hospital, and C L Agarwal and Sadhuram Bansal from the Marwari Relief Society. "Had the general secretary and I also resigned, the hospital would have closed down because it wouldn't have had any authorised signatory," Marwari Relief Society President and Century Ply Chairman Sajjan Bhajanka says. Image: The standard joke was that the 'M' in CPI(M) stood not for Marxist but Marwari. 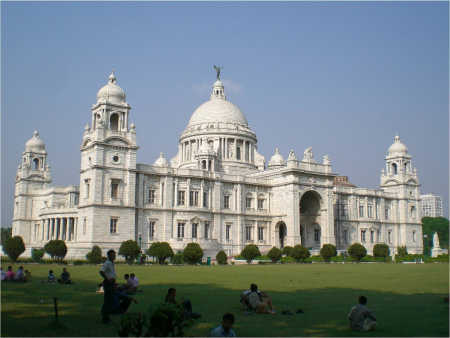 A view of Victoria Memorial in Kolkata. "The entire business community is peeved with the government's handling of the AMRI episode. The community is the lifeline of Bengal." That is true to a large extent. Marwaris have a total monopoly over the jute and stockbroking businesses. Tea, another Kolkata stronghold, is fragmented but the world's largest player in the game is a Marwari from Kolkata: Brij Mohan Khaitan. In local industry associations, their representation is 60 to 80 per cent. The Marwari families of Kolkata have included names like Birla, Dalmia, Mittal, Kanoria, Goenka, Lodha, Khaitan and many others. Most of them started out as traders but graduated to manufacturing in the last century. As they made money, these Marwaris set up over a dozen schools and an equal number of hospitals in the city. Then there are thousands of smaller Marwari traders in the city. Burrabazaar, in north-central Kolkata, is the hub of the city's Marwari community. It is a warren of narrow lanes lined with once-grand buildings of the early traders and zamindars of Bengal which have now been divided into small tenements where many of these Marwari traders live, conduct business in shops and offices, and even have their warehouses. Burrabazaar has several markets, called katras and pattis, dedicated to specific commodities - Mechua for fruits, Raja Katra for spices, Loha patty for hardware and so on. Fear stalks them now. "One should be careful that negative messages are not sent out," says R V Kanoria, the chairman and managing director of Kanoria Chemicals and Industries and the new president of the Marwari-dominated Federation of Indian Chambers of Commerce and Industry. "The economic agenda is contingent upon the mood. Banerjee needs a broader vision and needs to enunciate it." To be fair, Banerjee never promised Bengal big-ticket investments. After all, her rise from the ashes of the 2006 Assembly elections was driven by her success in driving Tata Motors' Nano small-car project away from Singur. The company, within no time, found a helpful chief minister in Narendra Modi of Gujarat and moved the entire plant, though one Nano car had been made there, to Sanand. 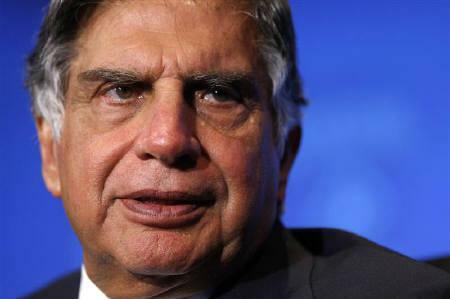 Tata Motors Chairman Ratan Tata had talked of a Good M (Narendra Modi, in all probability) and a Bad M (Mamata?). "Should we forget our commitment to the people of Bengal? We came to power on the back of these policies. 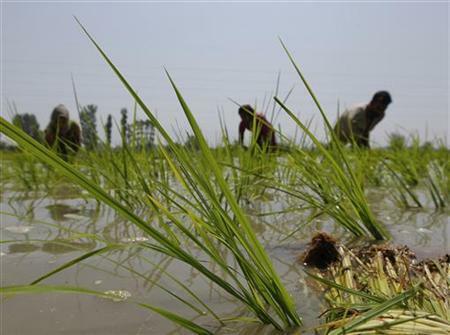 We will not go back on our land policy or on foreign direct investment," West Bengal Commerce and Industry Minister Partha Chatterjee says without mincing words. A Marwari businessman says it's more difficult to meet Chatterjee than Banerjee, though he doesn't take any decision without his boss's consent. Recently, when an industry captain told Banerjee that Lufthansa had joined the long list of international airlines that had packed off from Kolkata, she quipped that let it go, 10 more will come. To counter the growing tirade against its stance on industry, the state government recently came out with large advertisements on its achievements. 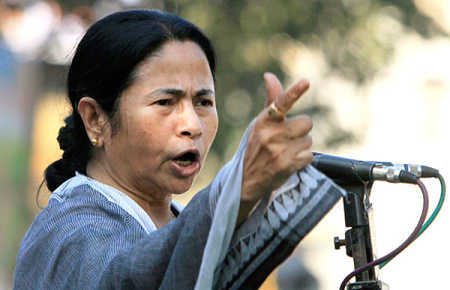 "West Bengal in Top Gear... In just six months, the state has received proposals to the tune of Rs 65,409 crore (Rs 654.09 billion) from various sectors," screamed front-page advertisements in many newspapers. The details of the investments - who, where, how much - are not available. Chatterjee has apparently saved the names to announce in the state Assembly. Not surprisingly, Banerjee's predecessor, Buddhadeb Bhattacharjee, is already punching holes in the claim saying that all the projects were bagged by his government. Some businessmen openly say that they are missing Bhattacharjee in office. 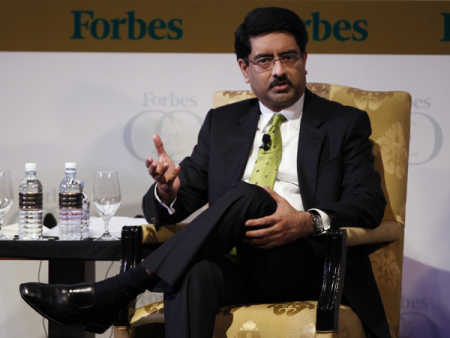 "He had singlehandedly transformed Bengal from a no-investment destination to the most favoured investment destination. Had the cars rolled out of Singur, 20 other factories would have come up. It was just a matter of time," a Kolkata-based industrialist with diversified interests says. 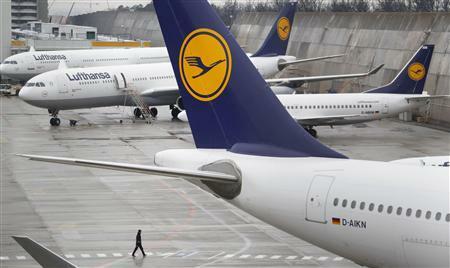 Image: Lufthansa has packed off from Kolkata. The list of abandoned and delayed projects is long: Bhushan Steel's six million tonnes per annum steel plant with Sumitomo of Japan, Videocon's six million tonnes per annum steel plant, JSW Steel's 10 million tonnes per annum steel plant, the PCPIR project of the Salim group of Indonesia and NRI industrialist Prasoon Mukherjee. "There are issues with the land policy. The government will have to acquire land. 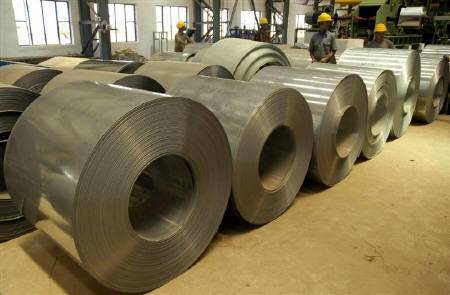 It is not possible to purchase land for projects like a steel plant without help from the state government," Bhushan Steel Managing Director Neeraj Singal says. One of the first things Banerjee did after becoming chief minister was to form a committee to draft a land policy, legitimising her pre-election stand of no government intervention in the acquisition of land for industrial projects. Slowly, it seems, Banerjee is losing support elsewhere too. Though the state's finances are a shambles, it hasn't stopped the "compulsive populist" in Banerjee from announcing sops. For instance, she has created 275,000 posts in the health, education and police departments. "Who will pay their salaries? The outgo could be as high as Rs 300 crore (Rs 3 billion) a month. 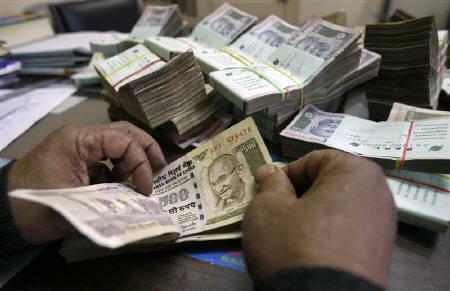 Already, funds are being diverted from central schemes to pay salaries," a bureaucrat points out. Image: Many steel plants have left the state. Another bureaucrat estimates that the half dozen sops she announced till July 2011 alone would drain the exchequer of Rs 400 crore (Rs 4 billion) a month. He stopped tracking the losses after the initial months. Much of Banerjee's problem stems from her style of functioning. "Nothing in this government moves without her consent. There is no delegation," an industrialist says. Bureaucrats say that at any point there are 600 to 700 files waiting to be cleared by her. Not to mention trust deficit. "District magistrates are encouraged to report directly to the chief minister. The delivery mechanism has gone for a toss," a bureaucrat says. It was hardly surprising that Chief Secretary Samar Ghosh, whose term ends on March 31, has politely refused the chief minister's desire to grant him an extension. A Marwari businessman who worked closely with Banerjee when she was Union Railways Minister says he has seen her morph from a doer and able administrator to a hard-core politician. "In the last eight months, there has been no qualitative paribarton [change] in West Bengal," disillusioned educationist Sunanda Sanyal, who was part of the celebrated Paribartan Chai campaign, which brought Banerjee to power, says. Sanyal has stepped down from education committees due to differences of opinion. Image: Sops announced by Mamata will drain the exchequer. Banerjee's tenure has seen high farmer suicides (at least 32), infant deaths (116 in Malda district alo#8800 no arrests, of course) and low take-off of the National Rural Employment Guarantee Scheme - the state has provided just 14 days of work, on an average, to each beneficiary, way below the national average of 45 days. Perhaps the most scathing review of Banerjee's government came from the mightiest proponent of the Paribartan Chai campaign, writer Mahasweta Devi. "Have we brought in fascism," the author and activist asked when the government refused to grant permission to a rights group for holding a rally a few months back. Not all is going Banerjee's way, but it's not that the eight months haven't seen any success. Her biggest success is, perhaps, addressing the Naxal issue in the state. The Marwaris are still hopeful. "The business community in Kolkata," says Adventz Group (which has 23 companies including the Zuari and Texmaco groups) Chairman Saroj Poddar, "are keen to work with the Bengal government to develop the state." The challenge for Banerjee is to make the transition from a street fighter to an able administrator with a vision for Bengal. Image: Mamata's tenure has seen high farmer suicides.